(1). 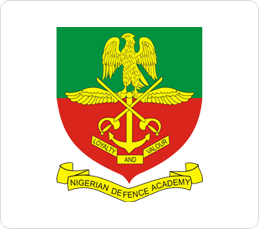 The candidates whose names appear as listed on the official website (via link below) were successful at the Armed Forces Selection Board held at the Nigerian Defence Academy (NDA) from 29 June - 9 August 2013. The candidates have been offered admission into NDA for the 65th Regular Course. They are to report for training at the NDA (Permanent Site), Kaduna on 21 September 2013. Any candidate who fails to report by 23 September 2013 will forfeit his or her place to a candidate on the reserve list. (2). Selected candidates will be received on arrival at the Reception Centre located at the Academy Parade Ground (Permanent Site). (3). Candidates on the reserve list are NOT to report to the Academy until they are invited. (4). Selected candidates MUST come along with the ORIGINAL copies of their School Certificate Results (NECO/WAEC) , and other credentials which include First School Leaving Certificate, Primary School Testimonial Junior/Senior Secondary School Testimonials, Birth Certificate/Declaration of Age and Parents’ / Guardians Consent Form and Letter of Attestation as to State of Origin. Any selected candidate who does not come with the listed documents WILL NOT BE ACCEPTED for training. Two white shirts (long sleeves). One lounge suite (dark colour). One pair of football boots. One pair of spike shoes. Two white bed sheets and pillow cases for 8 spring bed. One pair of black low heel cover shoes. Two pairs of black or blue short tight. (5). Selected candidates are not allowed to receive visitors and will not leave the Academy for the first 3 months of training. Selected candidates and their parents are to please note the restriction for strict compliance.